Poet Ralph Waldo Emerson writes: “Men are what their mothers made them.” If that is true, Ole Miss fans owe a huge debt of gratitude to the ladies who raised three of our most beloved Rebel players. The Rebel Walk is pleased to bring you our interviews with two mothers and one grandmother who raised former players Deterrian Shackelford and Cody Prewitt, and current Rebel Evan Engram. We were honored to talk with Sherry Shackelford, mother of Deterrian; Michelle Zelina, mother of Evan; and, Dottie Duckworth, grandmother of Cody, about their Rebels. They spoke candidly and offered a personal glimpse into the players’ lives, both as little boys and as adults. One thing became crystal clear in speaking with these Rebel moms and grandmother; their faith in God remains strong and unwavering, and it has helped shape Deterrian, Evan and Cody into the young men they are today. These Ole Miss greats share a background of faith and family, and this is part of what makes them so dear to Rebels everywhere. The love Ms. Dottie has for her grandson Cody is evident. She has been there every step of the way for the soft-spoken, hard-hitting Rebel safety. She lovingly began raising Cody and his little sister Caitlin when Cody was seven and Caitlin, two. Throughout our interview, Ms. Dottie was reluctant to take credit for her role in Cody’s achievements; however, there can be no doubt what a positive impact she had—and continues to have—on his life. RW: How did you raise Cody to be so humble? Mrs. Duckworth: He’s always been a humble, sweet kid. He’s always thought about other people. Nobody is perfect, of course, but Cody doesn’t like to hurt people’s feelings. I don’t know that I had anything to do with a lot of it. He just cares about people; he really does. He has also had some wonderful coaches in his life. There have been some very good, very godly men who have at different times been in his life to impart things to him and teach him. Cody is not puffed up; he knows where he has come from. He’s not perfect (except in my eyes), but he genuinely cares about people. RW: Cody was a leader on the Ole Miss team. Has he always assumed a leadership role, and what do you think helped him gain those skills? Mrs. Duckworth: Yes, he has always been a leader. That is something God placed in him. When he was growing up, I told him, “You are a leader. You’re going to lead somebody. Where do you want to lead them?” We all have abilities of some sort, but I do believe God gifted Cody with leadership skills. RW: Do you have a favorite game Cody played in at Ole Miss or a favorite memory of him playing football at Ole Miss? Mrs. Duckworth: The interception and runback for a touchdown at Texas A&M was pretty awesome! The Alabama game last year—knowing that it was Cody’s desire to leave Ole Miss with an Alabama win; that was great. But then there is also his first career interception. That was special because it came against Mississippi State. It was his freshman year, and it was pouring down rain. I never really liked going there (I don’t like those cowbells much), but that was an exciting moment. Also, Cody’s first time in The Grove was very special—watching him walk through the Walk of Champions for the first time. RW: Outside of his obvious skill at football, what makes you the most proud of Cody? Mrs. Duckworth: Oh my. I am the most proud of the way Cody treats people. He’s sweet, and he genuinely cares about people. He does not like to see people or animals hurt. I’m also very proud that Cody has “no quit” in him. He is a faithful, faithful person, and I am also proud of his integrity. I feel I am a very blessed woman. I thank God for letting me be Cody and his sister’s Grandmother—and that they still love me. I’m just proud of the person he is. I’m proud of the hard work and all his determination. RW: When multiple schools and coaches were vying for Cody’s attention, what stood out about Ole Miss to let you know it was the right choice? 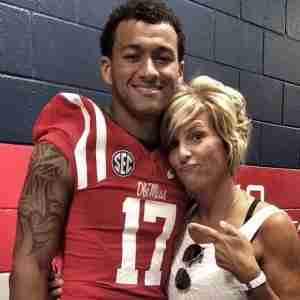 Mrs. Duckworth: After going to Ole Miss on Junior Day, Cody went to camp there later that year. On the Sunday of camp, I received a text from him saying, “I’m going to verbally commit to Ole Miss today.” I got him on the phone, and he said he was sure Ole Miss was right for him. Now, if Cody ever begins a sentence with “Nanny,” I know he is serious. So when he said, “Nanny, I know what I’m doing,” I knew he meant it. He said “This is what I want to do and I’ve talked to Coach Nutt.” I knew then that Cody would indeed go to Ole Miss. As for knowing it was the right choice, first of all, that’s where God destined Cody to be. He knew it and I knew it and we had a peace about it. Secondly, the family atmosphere really did it for me. I will forever be an Ole Miss fan. I have met so many wonderful people. There have been numerous people who helped Cody become a better man, a better person, and a better husband. Cody will never forget Ole Miss. RW: What advice would you give to parents or grandparents whose high school sons/grandsons want to play collegiate football? Mrs. Duckworth: Remember (parents) It’s not who they are. It’s what they do. It doesn’t define who they are. Have fun with it, but don’t let it drive you crazy! RW: How have you instilled such a strong faith in God in Cody? RW: What is it about Ole Miss that makes it so special to Cody? Mrs. Duckworth: The community and spirit of family—and a lot of genuine people—are what make Ole Miss so special to Cody. When Cody was about 10 years old, he was watching football on television. I happened to walk through the room and he said, “I’m going to play football at Ole Miss one day.” When we were on our visit at Ole Miss, I had a flashback that day of him being a little boy, telling me that he was going to Ole Miss. Like I said earlier, Cody will never forget Ole Miss. 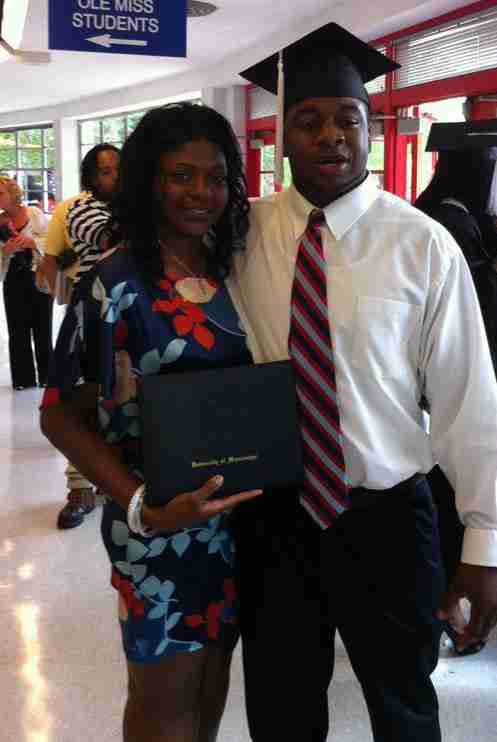 Her son Deterrian is a living testament to this, as he overcame two knee operations and redshirt seasons at Ole Miss en route to becoming the only two-time Chucky Mullins Courage Award winner in school history. RW: What did you do to help Deterrian stay so upbeat during his injuries and the two seasons he missed as a result? Mrs. Shackelford: Wow! This question is especially dear to me, because as a concerned Mom, you hurt when your children hurt! I wanted to take ALL of the pain from Deterrian, and I would have endured any ailments so he wouldn’t have to. But when I found out he was hurt, I never gave up hope that Deterrian would be at his best again. I knew the injury was another chance where God was able to speak to my son and tell him that through his circumstances he would be a testament for others. RW: How does it make you feel to know that your son is not only a Chucky Mullins Courage Award winner, but the ONLY one to have done so twice? Mrs. Shackelford: My first thoughts are: “To God be the Glory!” Deterrian has always exemplified courage, humility and strength. When reading about the personal character of Chucky Mullins and his ability to stay positive no matter what the situation was, I was struck by how Deterrian has some of those same characteristics. God has blessed Deterrian with a heart for others. 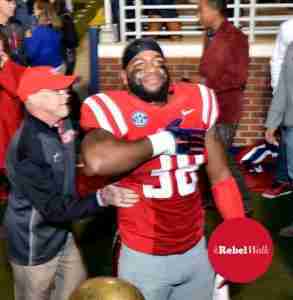 So winning the Chucky Mullins Award twice was a testament to fighting, persevering, remaining humble and having a “never quit” mentality. RW: Outside of his obvious skill at football, what has made you the most proud of Deterrian in his lifetime? Mrs. Shackelford: Wow! There’s not enough I can say on this question about Deterrian, but I will name a few things that make me most proud: his character kindness, meekness, patience, integrity, optimism and his manners. He treats his mom like a jewel—and still opens the car door or doors to any entrance for me. He treats all the women of our family with the utmost respect. He also has such a love for all youth and has a willingness to help others, as well as a love for his family and all those who support him outside of his family—like Rebel Nation! RW: What advice would you give to high school players who want to play football at the collegiate level and trying to decide where to go? Mrs. Shackelford: I encourage the student athletes to go where it feels the most like home to them. They need to believe in the program and school they are attending. After all, that will be their home for the the next four years, so they need to choose wisely and carefully. RW: Deterrian has experienced incredible success; how has he remained so humble? Mrs. Shackelford: Deterrian’s strong faith and belief in Jesus Christ keep him humble. Allowing Jesus to be that voice, direction and guide; that helps him stay humble. RW: How have you instilled such a strong faith in God in your son? Mrs. Shackelford: Ultimately, it’s up to our children to decide their commitment to God, but it was our duty as parents to create a foundation for him to build off of. Essentially, we have nothing to do with the adversity that comes into their lives, but as parents we can explain to them that as a believer, they will be an overcomer. RW: Is there anything you’d like to say to Rebel fans? Mrs. Shackelford: Our entire family would like to extend a warm “thank you” to Rebel Nation and the whole state of Mississippi for all your support and kindness, for caring for Deterrian, for showing genuine love. Rebel fans, you will always be in my heart for the kindness and generosity you have shown. You will always be dear to me and our family. God bless you all! Much like Cody’s grandmother and Deterrian’s mother, Evan Engram’s mother Michelle Zelina is a woman filled with a strong faith in God and a thankful spirit for her many blessings. In Evan, she has raised a young man with character and integrity, a natural leader. One only need speak with Ms. Zelina for a few moments before understanding why Evan is the faith-filled, compassionate young man he is. RW: Evan is a phenomenal player and has received many awards. How does he stay so humble? Ms. Zelina: When Evan moved away to attend The University of Mississippi, it really opened his eyes to several things. Mainly how you really don’t know how good you have it until it is gone. When he got hurt during the LSU game his freshman year, he couldn’t walk without crutches for seven weeks, and he needed a scooter to get around. He got a real dose of reality on what we all take for granted on a daily basis. That was about the same time he became friends with the Tetrick family, and he learned how the littlest things in life you take for granted are the things others are praying for the most. RW: What did YOU do to raise such a great young man who is always calm under pressure and who always conducts himself with so much class? Ms. Zelina: Evan knows to honor the Lord in all things. He knows that situations and events may not always go the way we would like, but if we are patient and stay faithful God’s plan is so much better! RW: Has Evan always been a leader, and what do you think helped him gain such strong leadership skills? Ms. Zelina: Evan’s dad and I were divorced when Evan was five, so even though he didn’t grow up in a two-parent household, his dad and I have always held him accountable. Then when he went to Ole Miss, the coaching staff has been an extension of what his dad and I instilled in him growing up. RW: Do you have a favorite game of Evan’s at Ole Miss thus far, or a memory that stands out above the rest from any particular game? Ms. Zelina: It was pretty awesome when Ole Miss beat Alabama, especially when Evan took off his helmet and got the 15-yard penalty which actually helped his team get the win. He even surprised me with a piece of the goal post for Christmas! But I must say my favorite game of Evan’s at Ole Miss thus far is the big win against Mississippi State. That brought the Egg Bowl trophy back where it belongs! RW: Outside of his obvious skill at football, what has made you the most proud of Evan so far in his lifetime? Ms. Zelina: Seeing Evan do well in the classroom and on the football field are both pretty amazing, but all the A’s and B’s and number of touchdowns can’t compare to his personal relationship with the Lord. That’s what makes the most proud of him! RW: When multiple schools and coaches were vying for Evan’s attention when he was in high school, what made him choose Ole Miss? Ms. Zelina: Evan knew when he stepped on the campus for the very first time, it was the place he wanted to be. He would have committed immediately when he was offered, but his dad and I wanted him to wait and make a few more visits to really be sure. RW: What stood out about Ole Miss to let you know it was the right choice for Evan? Ms. Zelina: What really stood out about Ole Miss to let me know it was the right choice for Evan were the people—Southern Hospitality at its finest. The entire coaching staff and their families have embraced Evan with open arms since day one. For that, I will be forever grateful. RW: What advice would you give to parents these days whose high school kids are wanting to play sports at the collegiate level and trying to decide where to go? Ms. Zelina: First, It starts way before high school—exposing them to different sports/universities at the collegiate level, planting that seed and explaining and discussing what it takes to get there. Second, keeping them humble. Your child may be a star athlete in his high school or even his district, but colleges recruit nationally. Out of all the high school athletes across the U.S., only 7 % (about 1 in 14) play a varsity sport in college. Only 2 % (1 in 50) play at the Division I level. Last and most important—hard work on and off the field. Evan wrote a quote in the 9th grade that I still have in our kitchen: “Hard work beats talent when talent doesn’t work hard.” Parents must stay involved. Most recruiters look at grades AND conduct reports from the 9th grade on. Remember, your child will be representing an entire university. RW: How have you instilled such a strong faith in God in Evan? Ms. Zelina: Evan knows the power of prayer is real! RW: Is there anything else you’d like Rebels to know about Evan or your family that they may not already know? Ms. Zelina: Evan once told me his biggest regret was giving up swimming. If football wasn’t such a big part of his life, he said he would have been the next Michael Phelps. RW: This is a difficult topic, but one that has probably impacted Evan’s life in untold numbers of ways. Evan was so close to sweet Chance Tetrick who died of leukemia last year at age 11. Evan meant so much to Chance—and vice versa. How has Chance’s death affected Evan, and how has he remained strong for the Tetrick family—including becoming like a brother to little Collins, Chance’s sister? Ms. Zelina: Chance and Evan’s relationship was not about Ole Miss football. In fact, Evan will tell you they very rarely talked about it. Chance saw Evan for who he is off the football field—the same with Jeff, Jenn and Collins (Chance’s father, mother and sister). Even though Chance and Collins are much younger than Evan and his sister, they share a bond that Evan understands. He made a promise to Chance when he went to see him in New York that he would always be there for Collins—not to take his place, but to be her other big brother from another mother. After speaking with these ladies, one sees why their sons and grandson are such incredible young men of character and faith. Thank you to Mrs. Sherry Shackelford, mother of Deterrian; Ms. Dottie Duckworth, grandmother of Cody; and Ms. Michelle Zelina, mother of Evan, for sharing them with all of Rebel Nation! 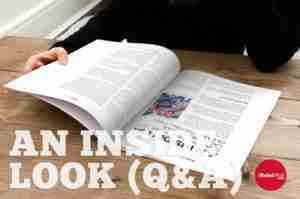 This article was also published in the September, 2015 print issue of The Rebel Walk magazine. Subscriptions are available here. Ole Miss Evie, this is one of the best articles you have ever done. 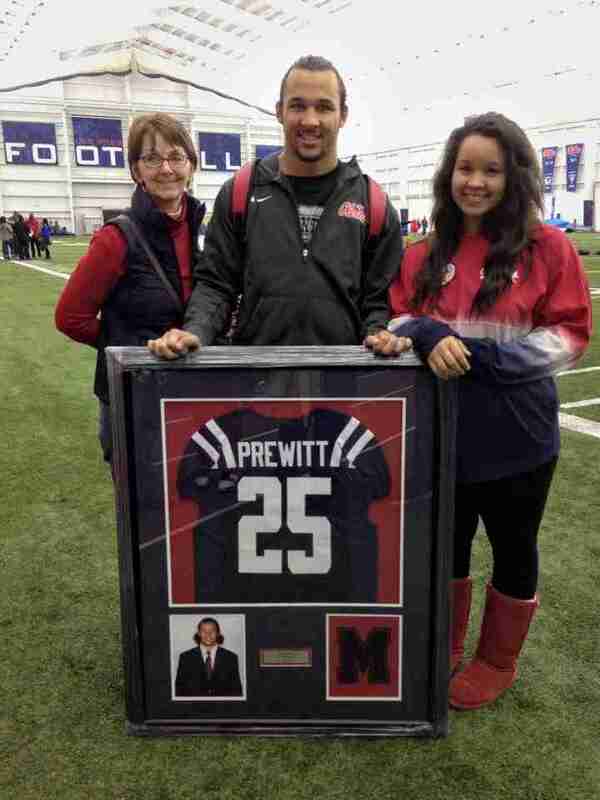 Rebel Nation loves the opportunity to learn about and get to know the families of our beloved players. Hotty toddy! Thank you so much, Donna! It is indeed a true privilege to get to know ladies like Deterrian’s mom, Evan’s mom, and Cody’s grandmother. Your comments are much appreciated. Hotty Toddy!